If you don't want to continue working 50 or more hours per week for the rest of your life, consider building your sources of passive income. Until you can remove yourself from being directly involved in doing the work that generates income, there's always going to be a limit to how much you can earn, and it can increase only very slowly. Passive income, on the other hand, is income that does not require your direct involvement. Rental properties, royalties on an invention or creative work, and network marketing are common examples. If you want to earn more, work less, and have a comfortable retirement, it's important to start creating passive income streams. Whether you're just starting your business, or you've been running it a while, the sooner you start thinking about how you are going to shift your business model to create more passive income, the sooner you can achieve personal and financial freedom. 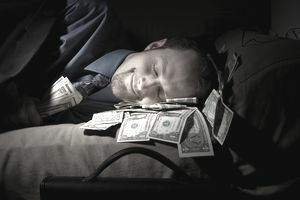 There are two basic types of passive income and a third type of income that, while not passive, still is a key strategy for earning more and working less. An insurance agent who gets a commission every year when a customer renews his policy. A network marketing or direct sales rep's income from her direct customers when they reorder product every month. An aerobics instructor who produces a video and sells it at the gyms where she teaches. A marketing consultant who creates a workbook and sells it in e-book format on the Internet. A photographer who makes his photos available through a stock photography clearinghouse and gets paid a royalty whenever someone buys one of his images. A restaurant or retail owner who has grown to the point of hiring a trustworthy manager. There are many different ways to generate residual income across a wide variety of businesses. It may be recurring income from the same customers or the sales of a product to new customers. It may require no personal involvement whatsoever, such as an e-book sold on a website, or it may require some personal interaction, such as the insurance agent calling the customer to remind them about their renewal. Often, it's something that you can delegate to an assistant. Note that this is different from recurring income which may still require your involvement to earn the income. For example, a coach or consultant on a monthly retainer, or a caterer who delivers lunch every Monday to the local school board has recurring income, but it comes from recurring work which limits on your earning capacity based on your own personal production capacity. An e-book author selling her e-book through affiliates who promote the product. A network marketer who builds a downline and receives commissions on the sales made by people in his downline. A general contractor who makes a profit margin on the work done by subcontractors. Franchising your business model to other entrepreneurs (the ultimate leveraged income). Again, there are many different models in many different businesses. The key is that you are making money off of other people's labor, rather than primarily your own. Note that leveraged income may or may not also be residual income. When you combine them, that's even better. Although these require your direct participation, your earning potential is much higher than if someone was just paying you a direct hourly rate. Fill a room with 1,000 people paying $50 each and you can cover your facility cost, promotional cost, and staffing fees and still have a nice chunk of change left over.